Sterling silver chunky linked bracelet, 190mm in length. Each 15mm wide link is a miniature replica of the ancient hillfort, also known as the Greenan Fort located in Inishowen, Co. Donegal. It is packaged in its branded Faller box which also contains our Grianan of Aileach descriptive leaflet. 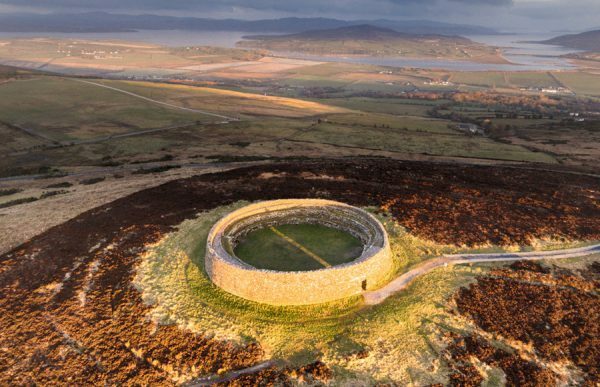 GRIANÁN OF AILEACH is located at the summit of Greenan Mountain in Inishowen, Co. Donegal, Ireland. Looking out over Lough Swilly and Lough Foyle the fort provides breathtaking panoramic views of counties Donegal, Derry and Tyrone. The existing fort itself was probably built in the early Christian era. From 789 it was the royal seat for the northern Ui Néill dynasty, those kingdom stretched from Northern Sligo to the Shores of Lough Neagh. It was abandoned in 1101 after its partial destruction by Murtagh O’Brien, king of Munster, who is said to have ordered each of his soldiers to take away a stone from the fort as they left, in retaliation for the Ui Neill’s sacking of his royal seat at Kincora. George Petrie who first surveyed the Grianán of Aileach in the 1830’s, described the ruins as a circular dry stone wall enclosing an area of 23.6m (77ft) in diameter. Standing 1.8m (5ft 11in) high, the wall varied from 4.6m (15ft) to 3.5m (11ft) in breadth.